It’s a (good) Small World after all! There is something about the $2 mark for a small cup of regular dark roast that is prohibitive for me to splurge on coffee-house coffee. $1.9x isn’t great but I’ll do it and $1.8x seems like the norm. Of course, $2 is (at most) only %10 higher than both of these, but there’s something about that evil #2 out in front that sends me over the edge. To make matters even worse for the egocentric Dr. Trot, Princeton is one of the most $#@&ing expensive places in the US, and this statistic most definitely includes the price of coffee. Princeton is also one of the smallest $#@&king places in the US, and as a consequence there are only two coffee-house options within walking distance of jail work. #1. Starbucks. Honestly, I debated whether or not to even include these guys at all. Starbucks food/beverages are unhealthy and over packaged as well as over priced. Never mind the low wages they pay their employees and the amount of food they waste. So, no. No thank you big evil corporation. #2. Small World Coffee. Now, these guys are a bit more my style. They’re a small business with two coffee shops, one on either end of town. They sell locally made pastries that you can carry out in paper bags, good coffee and apparently (keep reading) are cash only to keep overhead low and prices as low as possible. Small World coffee only hit this nasty $2 mark over the last few months as it was not this way when I moved here in June. Upon jacking up increasing their price last fall they did explain that it was in response to rising coffee bean prices. With the current state of the market and Small World’s desire to maintain the wages of their workers (rather than saddling the lower end of the payroll with absorbing the increased price of beans) up went the price of coffee for those of us who have no problem paying $1.8x/cup. Thanks a lot Small World. This is all well and good, but it has also sent you into the “too $#@&ing expensive to justify on the post-doc salary” category. Until today. UGH! DUH! MY GOD! x-( What an idiot am I?!?!?! With that, I bumbled through thanking her profusely, folded up my gaping jaw and staggered to the door with my steaming cup of highly caffeinated SW joe. 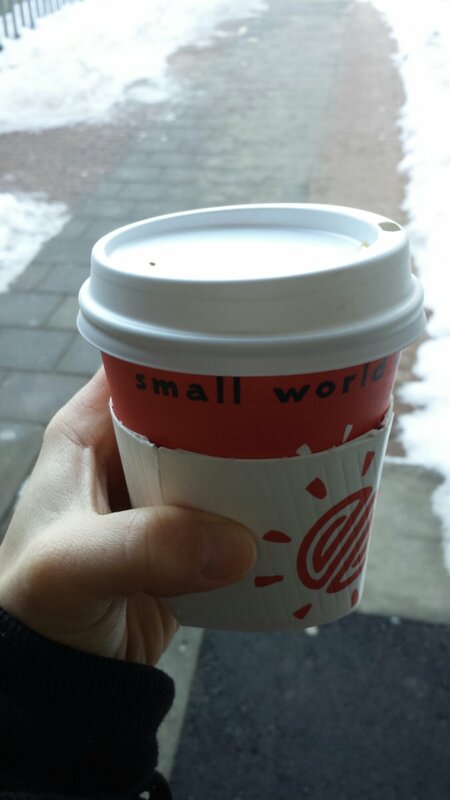 And also with that, I have to take back my animosity towards Small World’s $2 cup of coffee. They have a choice to make. Many choices to make in fact. They could buy different (read: worse) beans, they could pay their employees less and they could reduce their payroll and work their remaining employees more. They could do all of these and kept the price of coffee at $1.9x. They also could accept credit cards and charge even more than $2/cup. Finally, they certainly could send me (and every other idiot that doesn’t have $2 cash on them) packing for Starbucks w/o said cash. But, they don’t and they didn’t (5x). They also didn’t choose my job for me – the job that over-works and under-pays me – the kind of job that they are trying to avoid for their employees.